“It will be a life-threatening situation for the Ryukyu Islands of Japan with winds in excess of 100 mph. 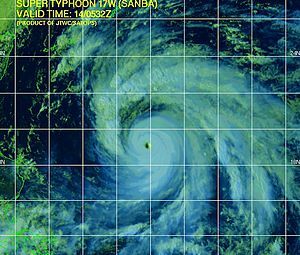 The worst case scenario for Okinawa is winds of 120-140 mph,” AccuWeather Senior Meteorologist Eric Wanenchak explained. Okinawa endured a hard hit from Typhoon Bolaven in August and a previous blow from Haikui. Even well ahead of Sanba, moisture from the typhoon will meet with a stalled front draped across South Korea. Several inches of rain may deluge southeastern areas before the typhoon approaches Jeju Island of Korea on Monday, local time, and the southern mainland of the Korean Peninsula by Monday night, local time. Rainfall of 1-2 feet is not out of the question, especially in mountainous terrain of South Korea. “The worst case scenario [for South Korea] is a widespread flooding disaster,” AccuWeather Expert Senior Meteorologist Jim Andrews said. Rainfall since July has been well above normal across portions of South Korea. Seoul, the capital and largest city of South Korea, has received nearly 40 inches (1 meter) of rain since July. With a significant rain falling before Sanba even approaches the Korean Peninsula with its high winds, trees and other structures may be weakened and more susceptible to wind damage. Keep checking back for the latest with AccuWeather.com.